This tutorial helps you to setup Apache Axis2 on Ubuntu and to add it to Eclipse IDE for Java EE Developers. Download the latest version of Apache Axis2 from this link. Enter the command given below to extract the Axis2 from the ~/Downloads directory. 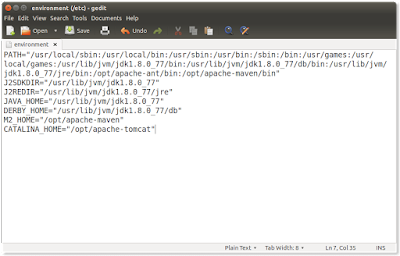 If your downloaded file is in any other directory and replace the last parameter by the actual file path. 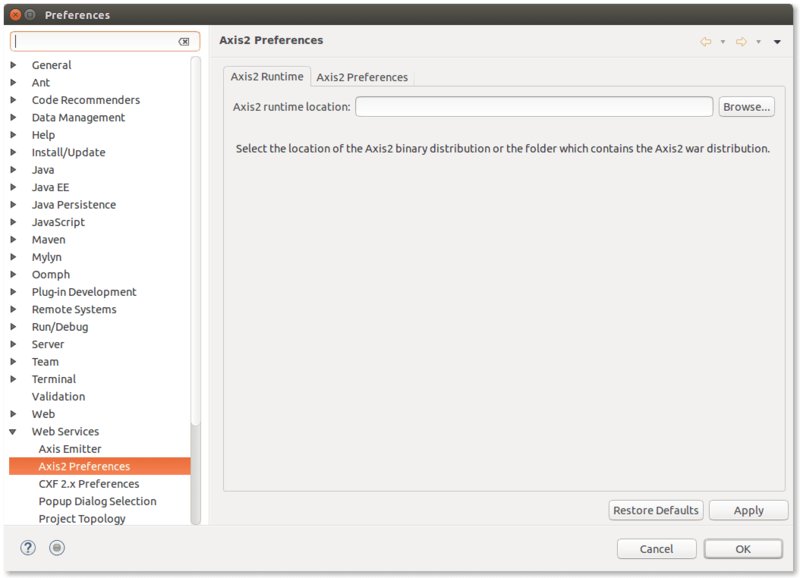 sudo unzip ~/Downloads/axis2-1.7.8-bin.zip -d .
Rename the folder name to axis2. To deploy web services, you may need to add some files inside this folder. Therefore it is required to change the permission of this directory. 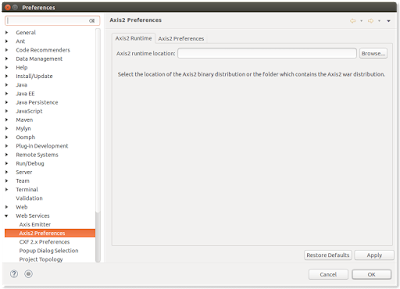 Enter the following command to change the permission of axis2 folder. 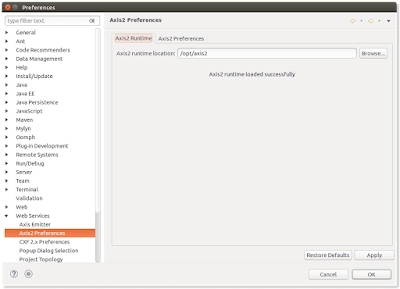 Environment variables AXIS2_HOME and PATH have to be added to the system. Enter the following command in the terminal to open the /etc/environment. 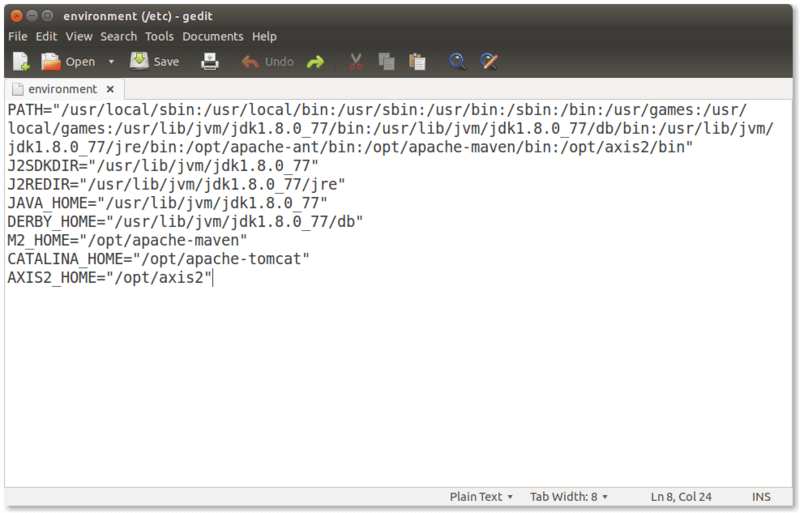 Add the /opt/axis2/bin to the PATH. Enter the following command to start the Axis2 server. Error: A fatal exception has occurred. Program will exit". Replace it with the following command. As you can notice, we simply remove the JVM arguments from the command. Save all the changes and start the server again. If you get the Deployed services page, you have successfully setup the Apache Axis2 in your system. To stop the Axis2, press Ctrl + C in the terminal which is currently running the axis2server. If you do not have Eclipse IDE for Java EE Developers, follow this link and install the Eclipse. 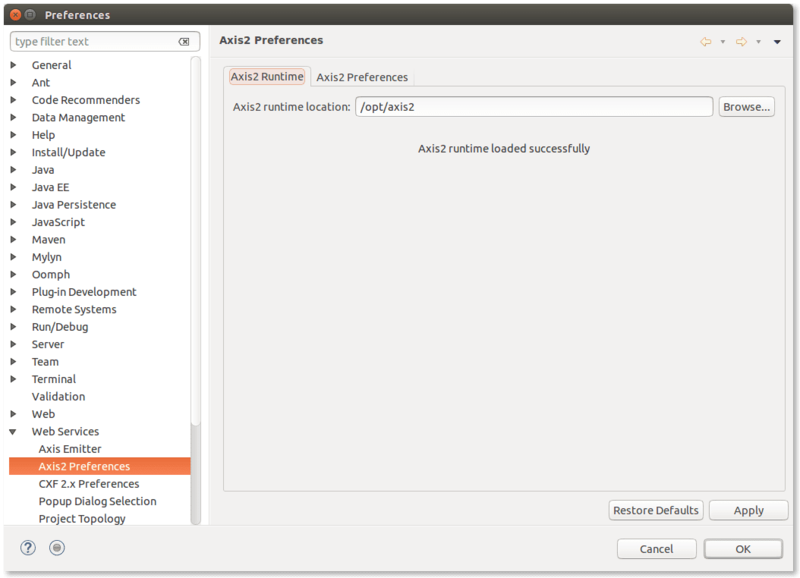 Goto Windows → Preferences in the menu bar and select the Axis2 Preferences under the Web Services. Click on the 'Browse' button and select the Axis2 home directory. Now you are ready to use Apache Axis2 from Eclipse.